Sweet potato casseroles rule at Thanksgiving. Which is no surprise—they’re festive looking and tasty. But when topped with marshmallows (as they so often are), they’re sweet enough to serve as dessert. So how about a savory alternative? 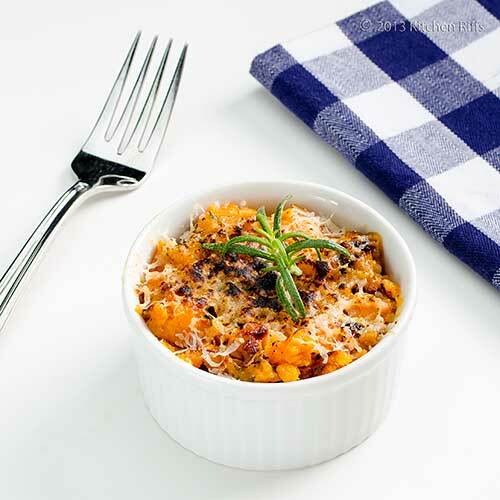 This casserole highlights the deep, rich flavor of sweet potatoes—while rosemary adds a herbal note, Parmesan cheese provides richness, and cayenne pepper gives it just a bit of a kick. You can do most of the prep and assembly work for this dish ahead of time (even the night before), and then just pop it into the oven when ready to serve. Which makes it one less thing to worry about on the big day. Works for me! This dish requires several steps, none of which are difficult. First, you need to cook the sweet potatoes and purée them. (We boil the sweet potatoes, but you could also roast or microwave them; more on this in the Notes). Second, you need to sauté onions until they turn a rich brown. This takes about 30 minutes, but you don’t need to hover over the stove while doing it—just give them an occasional stir. And it’s an activity you can do while attending to other kitchen tasks. Last, you need to assemble the dish in a baking pan. At this point, you can either bake the casserole right away, or refrigerate it and finish later. Convenient! What size baking dish to use? I use a 7-cup gratin dish (one that measures about 8 x 11 inches), and this recipe fills it up a bit more than half full. Alternatively, you could probably use an 8 x 8 or 9 x 9-inch pan. I sometimes divide the dish up into individual ramekins. This recipe is written assuming you’ll be using a baking pan, but the Procedure is the same for ramekins (though you’ll probably need 5 or 10 minutes less baking time). It takes about 40 minutes of prep and cooking to get the dish ready to go into the oven. Final cooking takes about 30 minutes (plus or minus). So figure an hour and a quarter total time for this dish, although much of that time is relatively unattended. This recipe makes 6 to 8 side dish-sized servings. Leftovers keep in the refrigerator for a few days if stored in an airtight container. Scrub the sweet potatoes and cut off their tips, but don’t peel them. Place the sweet potatoes in a large pot, cover with water, and add 1 tablespoon Kosher salt to season. Bring to a boil on the stovetop. When the water begins boiling, reduce it to a simmer and cook until a paring knife or fork can be inserted easily into the center of each sweet potato. Depending on size, this can take 20 to 35 minutes. When the sweet potatoes are done, drain them and allow them to cool for a few minutes. (See Notes for alternate methods of cooking sweet potatoes). Meanwhile, peel the onion(s) and cut in half through the poles. Slice thinly across the width. Put a skillet (preferably nonstick, and one with a lid) on medium stovetop heat. When hot, add the butter (or oil) and allow it to melt. Add the onions. Sauté until translucent (about 8 minutes). Add ¾ teaspoon Kosher salt and ½ teaspoon sugar, and stir. Lower the heat a bit, cover, and cook until the onions are brown (about 20 minutes), stirring every 5 minutes or so. You’ll be adding garlic to the onions during their last 5 minutes of cooking time (see next step). When the onions are done, remove them from the stovetop and set aside. Meanwhile, peel and slice the garlic. Add it to the onions about 5 minutes before the onions are done. Grate the Parmesan cheese. Reserve ¼ cup or so. At this point, the sweet potatoes should be reasonably cool. Peel them and cut them into chunks. Purée them with a food ricer or a food mill. Alternatively, place the cooked sweet potatoes in a medium-sized bowl and mash them with a potato masher or a heavy spoon. It’s OK if a few chunks remain. When the potatoes are puréed, add the heavy cream and stir to combine. Add the browned onions and the Parmesan cheese (except for the reserved amount). Add the chopped fresh rosemary, the cayenne pepper, and the black pepper. Stir to combine. Taste and add additional salt if necessary. Butter a baking dish and scoop in the sweet potato mixture. Smooth the top, and sprinkle on the reserved Parmesan cheese to evenly coat the top. Cover with shrink wrap and refrigerate until ready to bake (or skip the shrink wrap and bake right away if you wish). When ready to bake, preheat the oven to 375 degrees F (see Notes). If the casserole has chilled in the fridge, allow it to sit at room temperature for half an hour to warm up. When ready to bake, remove the shrink wrap and place the casserole in the oven. Set a timer for 20 minutes. At the 20-minute mark, remove the casserole to judge how it’s coming along—the sweet potatoes are already cooked, so you’re just warming them and browning the cheese on top. My oven tends to be slow, so I generally bake this dish for another 10 minutes or so. During the last 2 or 3 minutes, I often turn on the broiler and move the baking dish to the top rack of the oven to brown the casserole. Add rosemary sprigs for garnish, if you wish, and serve. Would you prefer to use a different method for cooking the sweet potatoes? The most flavorful way is probably to roast them. You can use our recipe for Roast Sweet Potatoes, but go easy on the seasonings—you’ll be adding plenty of flavors in this dish. A little rosemary goes a long way. So you might want to start with a smaller amount first, then increase if necessary the next time you make this recipe (believe me, there will be a next time). If you can’t find fresh rosemary, I wouldn’t recommend using the dried version—I’ve yet to find a brand that has any real flavor. Instead, I’d substitute fresh parsley or thyme (you can use fresh or dried thyme; if using the dried variety, halve the amount called for in the recipe). Fortunately, we never run out of fresh rosemary since we grow our own (outdoors during the summer, in a windowsill pot during winter). The volume of Parmesan you’ll get when grating depends on what type of implement you use. A microplane produces a fluffy, airy mound of cheese, for example, while a box grater produces something much more compact. So if you’re measuring by volume, make sure to pack the grated cheese firmly into the measuring cup. Exact quantities aren’t critical, however—you can use loads more cheese if you like. BTW, even though this dish is basically a gratin, I don’t usually try for a super brown crust. If you want a very brown crust, though, you should really pile the cheese on top (Step 7)—and then run the dish under the broiler right before you remove it from the oven. I like to use Kosher salt, but if you don’t have that on hand, you can use plain table salt (though I’d reduce the amount by about half since table salt is finer and more “condensed” than Kosher). You can bake this dish at a higher temperature than specified in this recipe—up to 425 degrees F or so. If you go this route, reduce baking time by a few minutes. “I’ve been haunted by the flavor of that sweet potato pie ever since,” I said. Am I a lucky guy, or what? This looks wonderful. I have made something similar but did not puree the sweet potatoes or add cayenne for heat. I am going to add this to our Thanksgiving menu, thanks for the post. I agree that fresh rosemary is a must, it has such a distinct flavor that is lost when it is dried. Hi Dahn, I've made this sliced sweet potatoes rather than a puree, and I think the puree works better. But both are good! Thanks for the comment. Hi Sage Trifle, rosemary and sweet potatoes is a dynamite combo! But I really like rosemary, so I think it goes with most things. ;-) Thanks for the comment. Casseroll is not that easy to captured, well done with your photograph! It sounds great. And looks delicious. I like everything with potatoes. I made tortilla de patatas some time ago and it was delicious. Need to try your casserole as well. I have sweet potato pie written down on my to-do list too. But here they're not orange but light yellow, so not very appealing. But I bet they'll be awesome in this casserole anyway! Hi Dedy, interesting idea to combine sweet potato and pumpkin - I'll have to try that. Thanks for the kind words, and for taking time to comment. Hi Marta, it really is wonderful! A good dish. As is tortilla de patatas - I haven't made that in ages, and need to again. Thanks for the comment. Hi Paula, we have some yellowish sweet potatoes, too. Flavor is good, but you're right the color isn't an enticing. Thanks for the comment. The yummy recipe looks complicated but actually its not :) I mindfully read through it. Hi Nusrat, those are 500 pixel, low-rez jpegs. Zooming wouldn't be a pretty sight! This really is a great recipe - worth trying. Thanks for the comment. Hi Barb, this really is good stuff. ;-) I was actually thinking of adding jalapenos to this dish, but decided against it. Will probably try it at some point. I hope you like this! Thanks for the comment. Hi Charlie, sweet potato casserole with marshmallow topping is practically a national dish! Well, at least very, very popular. This does combine well with turkey. A pork roast, too. Thanks for the comment. Hi Carolyn, leftover of this are great! I've had them for breakfast, though eggless - I gotta try that! Thanks for the comment. Hi Nee, doesn't rosemary have such wonderful flavor? We love it! Thanks for the comment. When I was a kid I never ate the sweet potato casserole with the toasted marshmallows on top. I am glad to say that I have grown to like them as I have gotten older. These look like some I could really learn to love. Of course these are not your mama's sweet potatoes. John, I love how sweet potato and pumpkin (squash) feature predominantly in the US for thanksgiving and Christmas. A superb recipe, again, thanks for sharing! Sweet Potatoes? Sign me in...This casserole looks absolutely terrific! Better than roast sweet potatoes? Say no more! I'll be trying this recipe as soon as possible. We don't celebrate Thanksgiving here in New Zealand, so sweet potato casserole is not something that generally graces a table here - especially not with marshmallows on top. I love the sound of this savoury version though. Hi Karen, I have to admit the marshmallow thing isn't my favorite, either. These, however, are terrific! ;-) Thanks for the comment. Hi Lizzy, both of these are great, but I have to give sweet potatoes the edge - much more versatile, and more flavor. IMO, of course. ;-) Thanks for the comment. Hi Denise, it is, it is! ;-) Thanks for the comment. Hi Beth, hard to believe, isn't it? Roast sweet potatoes are wonderful, but I think this dish edges them out. Definitely something you'll want to try! Thanks for the comment. Hi C&C, the savory version is delish - try it with roast pork. It's a wonderful combo! Thanks for the comment. I am so making this for Thanksgiving. Thank you for a great side dish! Rosemary is for remembrance and this casserole is surely one to remember John. I noticed you add salt to the sweet potatoes when boiling them. I've never done that. I will have to give it a try. Love the cream in this dish too, oh such goodness! Thank you so much for sharing this delicious recipe, John. I love that it can be prepared in advance too...Now, I'm looking forward to that Sweet Potato Pie! I love eating sweet potatoe, I like to eat them baked with nothing added. This recipe sounds delicious with all the ingredient that are in it. My family has always had the sweeter version, with the marshmallows. I would love to make this for them this year, and change things up a bit! Looks delicious! Sweet potatoes and rosemary - now that's a combination I've never tried. 2 to 4 tsp. will provide a significant rosemary flavor. Now I'm very curious. I think I just found one of the side dishes for Thanksgiving. Everyone in my family loves sweet potato casserole and the addition of rosemary will be a nice twist and delicious surprise. Thanks for this great recipe John! Looks delicious... I'm loving all these Thanksgiving recipes.. I'll make something to bring to the family, this looks fantastic. WHat a great combo.. potato and rosemary, love the sweet and savory combo. Hi Debra, this is terrific dish. Hope you enjoy, and thanks for the comment. Hi Louise, for the last couple of years we've been pretty lucky in swapping rosemary plant between our garden and our windowsill. That plant is getting pretty big, though, so I don't know how long that's going to continue! Anyway, thanks for the comment. Hi Uru, it's such a nice combo, isn't it? ;-) Thank for the comment. Hi Dawn, I think this recipe is "you" ;-) Worth trying, IMO. Thanks for the comment. Hi Kristi, the marshmallow version is good - and it's what I'll be having this Thanksgiving because I'm not making it - but this is better. ;-) Thanks for the comment. Hi MJ, I suspect you're closer to the 4 teaspoon side of the scale, but I could be wrong! This is a wonderful dish - hope you enjoy. Thank for the comment. Hi Honey, aren't all of these Thanksgiving dishes great? This one is particularly good. :D Thanks for the comment. Hi Kumar, isn't this nice? Truly delish! Thanks for the comment. Lip-smackingly good! A fabulous cold weather dish. I love LOVE love sweet potatoes. This will make a great side dish to Thanksgiving turkey. I like the addition of rosemary which makes it more savory rather than candied. Thanks for sharing, John! This sounds so delicious, savory and comforting. Great idea!! Hi Rosa, this really is such a nice dish! Full of flavor. ;-) Thanks for the comment. Hi Holly, the rosemary certainly does get one's attention! It's flavor is so distinctive, but in a good way. Thanks for the comment. Hi Dan, isn't this nice? Wonderful flavor! Thanks for the comment. I often think sweet potatoes make better dessert than side dish, but these totally change that. Such a great flavor combo! THIS is a winner!! I love everything about it. Hi Laura, I agree so many sweet potato sides are basically dessert! Nothing wrong with that, though. ;-) Thanks for the comment. Hi Gayathri, it's totally delish! ;-) Thanks for the comment. Hi Judy, don't sweet potatoes combine so well with rosemary? The flavor is so wonderful. Thanks for the comment. Hi Maureen, it's really a wonderful recipe. Loads of flavor! My favorite kind. ;-) Thanks for the comment. This would make SUCH a delicious side for Thanksgiving, John! What an abundance of warm fall flavor and comforting goodness in this casserole. Lovely recipe! This casserole looks delicious John, and yes, I love the touch of the cayenne...and sure this dish is perfect at the Thanksgiving dinner table. Rosemary and sweet potato go so well together. I just love that combo. 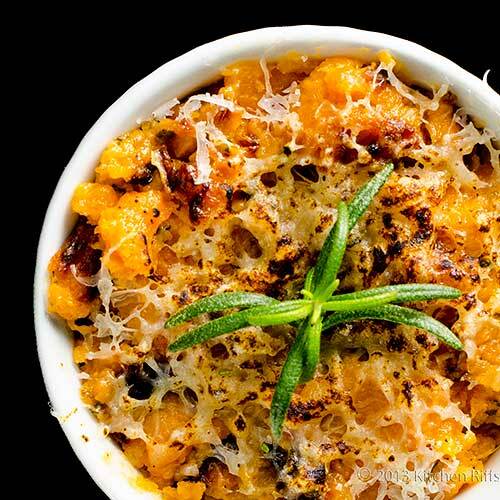 Savory sweet potatoes - with caramelized onions - in a casserole - good gawsh - whats not to love! Thanks for sharing - this looks absolutely drool worthy! Hi Georgia, isn't this nice? And it really does have tons of flavor. Thanks for the comment. Hi Liz, sweet potatoes rock, and they're so good in this recipe! And the rosemary really adds loads of flavor. Thanks for the comment. Hi Juliana, the cayenne really adds an interesting twist! Makes an already good dish better, IMO. Thanks for the comment. Hi Vanilla Sugar, isn't that a dynamite combo? I have made sweet potato hash with rosemary before - excellent combo! Thanks for the comment. Hi Shashi, what's not to love, indeed! This is a totally fun dish - and tasty! ;-) Thanks for the comment. This is a wonderful combination of ingredients, save the sweet stuff for dessert, I'll take this any day! My mom can't stand the sweetened version of sweet potato casserole so I know she'd love this! I can't wait to make it for her this Thanksgiving! Thank you for sharing John! This looks amazing John! The colour is gorgeous and the flavours are great. I'd like to make something different with sweet potatoes but my husband is from South Carolina, and he insists on his family's sweet pot casserole. Thankfully, it doesn't have marshmallows but a pecan streusel so it turns out really tasty, but one day I'd like to try a different dish! I'll just have to make it for dinner one day. Hi Chris, isn't this nice? And I agree on saving the sweet stuff for desserts! Thanks for the comment. Hi Monet, this sounds like a winner for your mom! Thanks for the comment. Hi Nazneen, the pecan streusel sounds pretty good! This is worth trying, though, although probably not for Thanksgiving since your husband expects his traditional favorite. But do try it another time! Thanks for the comment. Hi Adrian, isn't the color terrific? And the flavor is even better! Thanks for the comment. Hi Raymund, it's a totally delish dish - definitely worth trying. IMO, of course. ;-) Thanks for the comment. What a yummy casserole! I love all the sweet flavors in it and casserole is just so comforting. :) Thanks for sharing your scrumptious recipe. I'll have to give this casserole a go. Love the rosemary, the parmesan in contrast with the sweet potato. Thanksgiving perfect! I am loving the sound of this. Rosemary is one of my favorite herbs so I know this tastes over the top! Good stuff and good for turkey day! Hi Amy, isn't this nice? The flavor of this is amazing! Thanks for the comment. Hi Kitchen Butterfly, the Parmesan really works so well in this dish - just a nice, nice flavor. Thanks for the comment. Hi Abbe, doesn't rosemary have such great flavor? Good stuff indeed! ;-) Thanks for the comment. I can smell the aroma coming out of your wonderful sweet potato and rosemary casserole! This is something really cool to be tried with sweet potato. My family would love this! Great dish John - this would be a big hit at Thanksgiving and I love that 98% of the work can be done in advance! Hi Purabi, this is really such good stuff! And you're right that the aroma is fantastic. Thanks for the comment. Hi Allyssa, don't you like make ahead dishes? Or at least ones that are largely make ahead. My favorite kind! Thanks for the comment. John, this is a stunningly simple and tasty dish. A perfect pie for our Thanksgiving table. The color and the cheese on top looks so nice. Lovely dish John. This will be a perfect side dish for T-Day. Great post and pinned! Hi Asha, it's really a great dish - so delish. And I agree the color is great! Thanks for the comment. Hi Anne, this is a terrific side - tons of flavor, and I really like how it looks, too. Thanks for the comment. Your recipes are we written. and not to mention the convos that you and Mrs K have and the notes that you share at the end. The colors and the flavors of the dish is definitely Thanksgiving perfect! I love the flavors going on in your sweet potato casserole.. I make it every year. Like you said mine is the sweeter one. Only this year I plan to make mashed potatoes and have been searching the best ones. Your sweet potatoes sound great and savory I will definitely try them in the near future. I hope you and your family have a happy Thanksgiving. Hi Malou, isn't this a pretty dish? Thanks for those kind words, and for taking time to comment. Hi Kristi, the best thing about roasting the sweet potatoes is you get their great flavor in this dish! Double win! ;-) Thanks for the comment. Hi Vicki, loads of butter and cream are your friend in mashed potatoes! Thanks for the comment, and I hope you have a terrific Thanksgiving too. Oh my gosh John, this is one gorgeous casserole. Love the rosemary in it too, great addition. You do good work sir. Hi Kim, isn't it nice? Loads of flavor - you'd like. Thanks for the comment. Nice and simple casserole. Loved the flavors you used. I am a fan of sweet potato in any form and this sure is a tempting dish!!! Hi Shibi, I much prefer a savory sweet potato dish to a sweet one, except for dessert of course! This really is nice. Thanks for the comment. Hi Kiran, there's something about combining sweet potatoes and rosemary that's magic! Thanks for the comment. Hi Candy, it's really a great dish. I hope you enjoy! Thanks for the comment. I can imagine how delicious this must smell while preparing. And the waiting time for the casserole to be in the oven is the hardest! I always love having leftover casserole and with this recipe, even better! Hi Nami, I agree waiting for something to finish cooking can be so hard! Particularly with wonderful aromas escaping from the oven! ;-) Thanks for the comment. Perfecto se ve muy rico y goloso me gustarìa probar,abrazos. Hi Rosita, it is indeed very rich and does have a nice sweet undertone to it! Thanks for the comment. Hi Ilke, Parmesan and sweet potato makes a really nice combo. And I'm OK with making pastry crusts, but you really don't need it with something like this - and one less step to do, which is nice. Thanks for the comment. Hi John, very interesting recipe. It look awesome, the combination look so good. We do take alot of sweet potato but have not try casserole. Thanks for sharing your delicious recipe. Hi Amelia, this is a fun dish to make - totally tasty! Thanks for the comment. Hi, John! 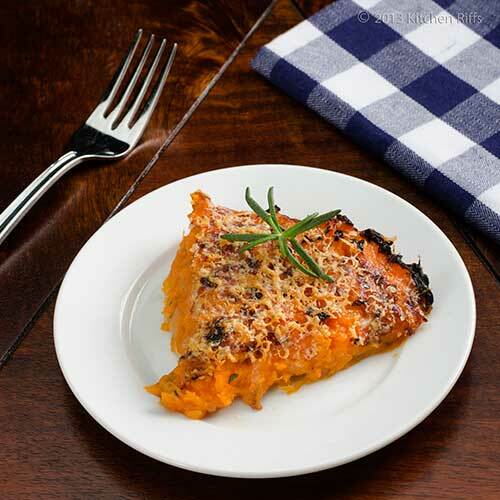 I love how you combine the sweet potato with parmesan: I can almost taste it. Great idea, to add the rosemary. Hi Alex, everything about this dish really works! 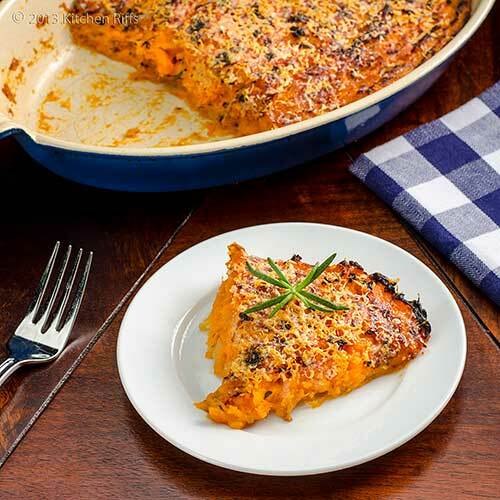 Parmesan and sweet potatoes pair wonderfully. ;-) Thanks for the comment. Hi Terra, where you live you might be able to winter rosemary over. Maybe! I hope you have a great Thanksgiving too, and thanks for the comment. Looks pretty darn good. I would never of thought you Americans would put marshmellows on top of a sweetpotato casserole - Very bizarre. Hi Lizzie, basically those marshmallow sweet potato casseroles are dessert! Served as a side. ;-) These are better (much!) IMO. Thanks for the comment.